A body of Sri Lankan professionals living in the UK have reported to the commonwealth about the executive controlled impotent justice system in Sri Lanka, to seek immediate intervention to ensure that the government of Sri Lanka adhere to the Commonwealth (Latimer House) Principles, with regards the judiciary. The report submitted to the Commonwealth draws its attention to the abuse of National List to elect rejected candidates as MPs by the political party secretaries, which is now being challenged in the Supreme Court, by the public interest litigation activist and a lawyer Nagananda Kodituwakku, with a request made to appoint a fuller bench of the Court to hear and determine this case, considering the national importance of the matter. However, the Chief Justice giving no reasons whatsoever has arbitrarily rejected the request. The CJ stated that in his opinion the case filed challenging the abuse of people’s sovereign right of franchise is not a matter of national importance. This ruling, apparently made under intense pressure from the Executive, has then been challenged by the Counsel Kodituwakku on the basis that CJ’s ruling was manifestly flawed, as the CJ had failed to give any reasons, justifying his ruling on a matter of national importance, despite it directly affecting the sovereign right of franchise of the people a right protected by the constitution. 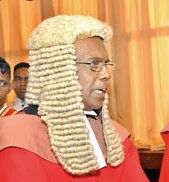 In this backdrop the counsel had urged the CJ by a Motion filed in Court to appoint a fuller bench to hear the case, sans the Chief Justice K. Siripavan, as he has shown his bias towards executive. The counsel has also requested the Chief Justice not to appoint Justice Sarath Arbrew (an accused charged on a indictment served on him) and also Justice Eva Wanasundara, as she had refused to release Supreme Court determination record citing that it contained ‘classified information’. Whereas the said record contained the blatant fraud involving all three branches of the government; the legislature, the executive and also the judiciary which permitted the 14th amendment to the Constitution 1988, without refereeing it to the people at a referendum. The Counsel had also informed the Court that it had already violated the Constitution for its failure to hear and determine the case filed in Court on 13th Oct 2015 [within the stipulated period of two years]. In this background CJ has alleged that the stand taken by the Counsel Kodituwakku, where the counsel stated that the hearing should be held without the presence of the CJ, was an ‘obstruction of justice’. The CJ has called upon the Bar Association for the 26th Jan 2016 to make its own observations on the CJ’s allegations made against the Counsel Kodituwakku. The report states that intimidatory tactics adopted by the Chief Justice against the Counsel Kodituwakku are clearly tantamount to obstruction of justice. Therefore, the report furnished to the Commonwealth by the movement for Social Justice Sri Lanka, urge the Commonwealth to take meaningful steps ensuring the Government of Sri Lanka honour and respect its obligations to the Commonwealth Charter and the Commonwealth (Latimer House) Principles applicable to all three branches of the Government. Totally agree with BBS ,democracy is not for 3rd world developing countries like us .best example is Singapore if Lee Kuan Yew establish full democracy when he become the president he will never be able to bring Singapore as it today . I have read the papers about this case, filed in the Supreme Court and published by media. The Counsel argues that the President Jayawardene has refused to follow the procedure prescribed by Chapter 12 of the Construction when the relevant law (section 99A,) was enacted in 1998 and it had been enacted by fraudulent means involving all three limbs of the government. This argument is based on the fact that the 14th Amendment bill was not published in the gazette and despite this the Supreme Court had allowed it without been referred to the people at a referendum. Therefore, in this case the Counsel argues that by operation of Section 82(6) of the Constitution, the clause introduced by section 99A that permits party secretaries to elect defeated candidates, as MPs has no force in law. Unfortunately, in Sri Lanka law does not prevail and it can be twisted to please those who control the Supreme Court. 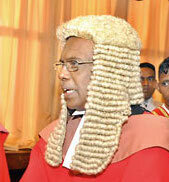 All know that CJ Siripavan is controlled by the government is under obligation to Sirisena who appointed him as the CJ. As one reader already had mentioned if not for Sirisena and Wickaramasinghe, Siripavan, would never have, even a slightest chance, to become the CJ. (If not for the dismissal of CJ Shirani Bandaranayaka on the orders of the Prime Minister within 24 hours of her reappointment, she should have been the CJ for another 7 years. Therefore, in my view there is nothing to prevent, Chief Jusitce Siripavan from ignoring the law and dismissing this case. He has already done the basics right and refused a full bench hearing and asserts his right to hear this case. My gut feeling is that CJ would protect Sirisena and would ignore the law and would not allow this case to be heard. You pontificate as if you are born yesterday and a lily white! You are a man who was charged on bribery in the High Court before late FND Jayasuriya. Have you forgotten your past? Giving you the benefit of doubt does not mean that you did not take the bribe but just that the charge was not proved. Pl. do not preach “Wedi Bana”. When you were charged in the high court you were a customs officer. There is a presumption that all coustom officers are bloody bribe takers. There are no honest coustoms officers In Sri Lanka. This is very serious allegation made against you and we want to hear from you. How on earth the CJ can call upon the Bar Association??? CJ is clearly deploying scar tactics against one party.This stance is clearly unacceptable by someone who holds position as CJ and must immediately step down. This clearly shows that the CJ has already made up his mind even before the trial. This case must be heard by a impartial panel. This case is clearly in the public interest and conducive to the impartiality in justice. Obstruction to justice has caused by the CJ not by the litigant. Electing defeated candidates by the National List is not only a farce but a scam carried out by the dishonest arrogant rulers of this country.